The system dump, which we have since confirmed as legitimate and along with dozens of other IRC members mirrored to multiple destinations, indeed belongs to a Nexus 4 (mako), and the build number is indeed JWR66N. The radio and bootloader are missing right now - Jeff promised them tomorrow - so I have my doubts about a working port to other Nexus 4s for the time being. In the meantime, the system dump itself is ready to go, and Ron and I are ripping through it as we speak. We'll have a teardown ready for you soon if we do dig something up, and by the looks of things, there's enough for a post. I'd like to thank Jeff for his persistence as well as IRC users efrant, gravufo, Jason__, vividboarder, Introspection, and everyone else who drove this one to the finish line. Update: There's chatter on IRC that restoring the backup via TWRP recovery seems to work. I flashed my Nexus 4 using a flashable zip and have a quick guide on how to do this coming up shortly. It boots, and it works. Update #2: One of the goodies inside the dump is a new Play Store v4.2.3. Go grab it. 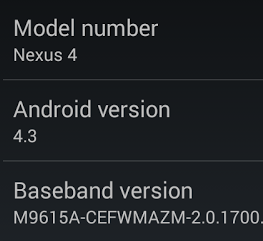 Update #4: Here's how to update your Nexus 4 to Android 4.3 from this dump.